TurboRoo was only 4 weeks old when he was brought into The Downtown Veterinarian in Indianapolis, Indiana. The breeder surrendered him, expressing concern because he was born without his two front legs and knew that he would need more one-on-one attention. Now TurboRoo is happily adopted, loving life and inspiring others to do the same. 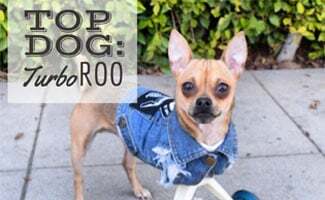 He has such an uplifting story to share and we were thrilled to have the chance to chat with Turbo’s mom and TurboRoo himself. First, a few questions with Turbo’s mom…. Where did the name TurboRoo come from? The name TurboRoo came from the fact that Turbo is from Speedway, Indiana. I named him after the movie Turbo, an underdog “snail” who wins the Indy 500! Since he moved much like a snail (on his chest), was an underdog and also came from Speedway, Indiana, the name just “fit”. The “roo” portion came from the fact that he use to be carried around in his mom’s scrub pockets at the vet clinic. Your story is so inspiring, what motivated you to stay strong? I have always had a soft spot for animals who need a little extra attention. Turbo was set to be euthanized. No one wanted to take him in, let alone give him the chance to be the amazing dog that he is today! He is one of the strongest dogs I have ever seen in my 6 years of technical work. A little love and devotion and he has been given a better life than most people. Turbo has been flown to NYC, L.A, Colorado, etc. 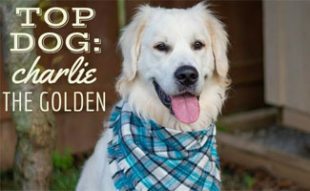 He has given new life to many dogs who would have been euthanized. You’ve met some cool celebrities, including Colts players! Tell us more. We have been given the chance to educate lots of people, some of them being celebrities. It is always very rewarding to meet people who are famous, but the biggest memories are people who TurboRoo has touched personally. Some that we consider “celebrities” are not celebrities at all. But people we will never forget including those learning to walk again after a stroke or young kids that are survivors of a certain disease. Meeting Matt Overton from the Colts opened us to a whole new world of kids who were survivors much like Turbo. Can you describe the best wheels you’ve Ever worn? The best wheels to date are version number, I believe, 10!? This was a HUGE work in process. It took multiple people, and multiple designs to finalize a wheel set that would work for Turbo! We have been working since he was 4 weeks old and we stopped at about a year and 4 months. My personal favorite past times have been meeting people who have had their lives changed thanks to Turbo. I had no idea adopting a little puppy no one wanted would allow me to meet so many amazing people who look to Turbo for inspiration. And now a few questions with TurboRoo himself! Who are Your siblings and how do you get along? I have multiple siblings. RubyRoo my sister also has two legs. My mom donated a cart to her foster family at the time. The foster family decided that her perfect home would be with me! My mom quickly agreed and adopted her. We have been best friends ever since. My mom has recently taken in a kitten who needed a double back leg amputation due to a birth defect. She fits right in! She will be fitted with a wheelchair very soon! Any special tricks you can do? Anything from BarkBox! They send some AWESOME treats and toys! I love getting new, exciting treats every month! 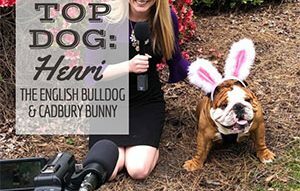 What’s your favorite part about being a celebrity dog? I love giving back. I also love educating people! The fact that I could have been euthanized yet was saved and have been able to save many more animals and educate others is amazing. 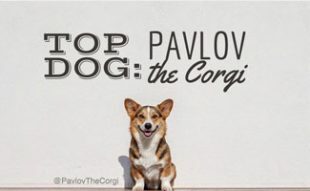 Who are some other Top Dogs you admire? I love all the “handicapable” animals that have since started their own social media sites since I gained fame. The more animals that can showcase the quality of life us BiPawds have is amazing. What do you want to share about #NubLife? We’d love to help spread the word. NubLife is being proud of being different. I am proud to have been born this way. I am proud that someone (my mom) gave me a chance. Us “handicapable” animals need it more than ever. With the overbreeding and inbreeding that happens more and more. I love the fact I can show people this issue needs to be addressed. At the same time, animals born like me DO NOT need to be euthanized just because we aren’t born “normal”. This is NOT the cool new thing. But, when an animal is born like this, they should be given the chance to experience life and that is MY goal in life! 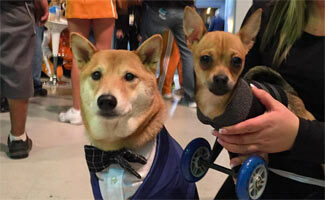 Watch this adorable video of Turbo Roo dressed up as Jaws racing along on his wheels. Looking to have some more fun with Turbo? 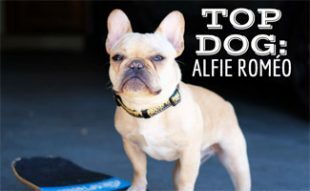 Follow him on Instagram (@TurboRoo), Twitter (@RooTurbo) & Facebook to track his adventures. 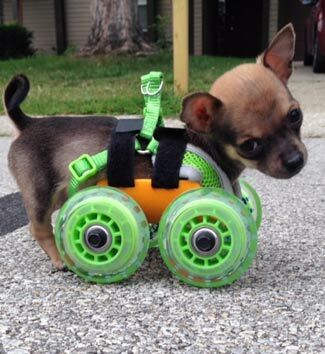 We promise he’s #WheelyCute! What inspired you most about TurboRoo’s story?